India-Pakistan tension LIVE News Updates: The Indian Army, Air Force and Navy will hold a joint press briefing at 5 pm on Thursday on the security situation between India and Pakistan. India-Pakistan LIVE Updates: The Indian Army, Air Force and Navy will hold a joint press briefing at 5 pm on Thursday on the security situation between India and Pakistan. 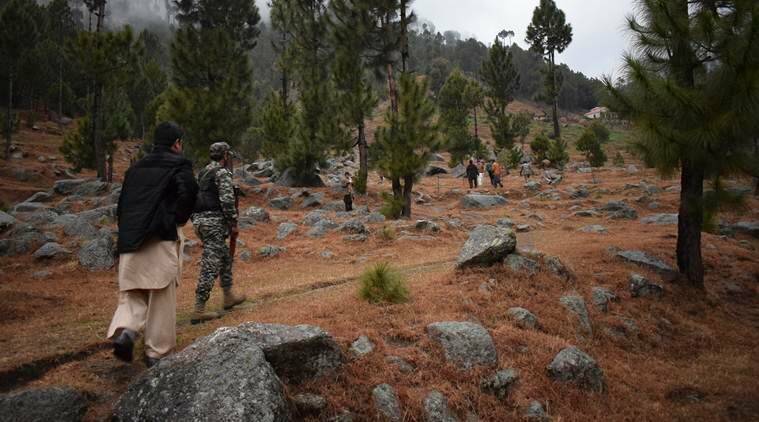 Tensions between the two countries heightened Wednesday after Pakistan violated India’s airspace in response to India’s counter-terrorism operation against Jaish-e-Mohammad terror camp in Balakot. Following an aerial engagement, an Indian pilot was captured by the Pakistan Army. India has demanded the immediate release of Indian Air Force (IAF) pilot Wing Commander Abhinandan and has “made clear that Pakistan would be well advised to ensure that no harm comes to the Indian defence personnel”. Addressing BJP booth workers, Prime Minister Narendra Modi said, "India is grateful to all those who are protecting the nation. India will live as one, will work as one, will grow as one, will fight as one and will one as one." The IAF pilot is a reminder that conflict between nations has a terrible human toll, that it is a price that is always too high to pay. It is a cost, moreover, that imposes a duty on all — government, political leaders, media and civil society — to speak carefully and act with sobriety. It needs to be recognised that the events over the last couple of days may be the beginning of a long haul and that in these times, every step has consequences. UN Secretary-General Antonio Guterres has expressed "deep concern" over the escalating tension between India and Pakistan and has called on both sides to take steps for a "meaningful mutual engagement", reports PTI. The Indian Express has learnt that US Secretary Of State Mike Pompeo spoke to foreign minister Sushma Swaraj yesterday while Admiral Philip Davidson, Commander of United States Indo-Pacific Command, spoke with Admiral Sunil Lanba, the Indian Navy Chief. Sources said that US Ambassador to India, Ken Juster also engaged with foreign secretary Gokhale. Similar engagements were also done with Islamabad by the US administration on Wednesday. The talking points with both sides included calls for restraint and de-escalation. The US official also asserted that Pakistan must do more to counter terrorism. US Secretary of State Mike Pompeo spoke separately with the India and Pakistan foreign ministers on Wednesday and urged them to "prioritise direct communication and avoid further military activity". Wing Commander Abhinandan Varthaman caught in Pakistan is the son of retired Air Marshal Simhakutty Varthaman. According to defence portal bharat-rakshak.com, Abhinandan was commissioned as a fighter pilot on June 19, 2004. It is learnt that he had recently completed his training at the Defence Services Staff College in Wellington, Tamil Nadu. The course trains officers from all three services for command and staff appointments. Former Karnataka CM B S Yeddyurappa said Balakot strike has created a wave in favour of Prime Minister Narendra Modi and will help the party win over 22 of 28 seats in the state in the upcoming Lok Sabha elections. A Union Cabinet meeting will be held Thursday at 7, Lok Kalyan Marg. The Pakistani government has said the Samjhauta Express has been temporarily suspended on Thursday -- it runs on Mondays and Thursdays -- in view of the "prevailing tensions between Pakistan and India". It added that operations will resume when the security situation improves. According to Dawn, 16 passengers were to board the train today. Union minister VK Singh says Wing Commander Abhinandan, who is in Pakistan's custody, is mentally tough and a selfless and courageous soldier. "During these testing times the country stands, as one, behind him & his family. Our efforts are on and under the Geneva Convention we hope that the brave pilot would return home soon," he adds. The US, UK and France have moved a fresh proposal in the United Nations Security Council (UNSC) to ban Jaish-e-Mohammad chief Masood Azhar, reports news agency PTI. JeM had claimed responsibility of the Pulwama attack which killed 40 CRPF personnel on February 14. The proposal is reportedly the fourth such bid at the UN in the last 10 years to list Azhar as a global terrorist — India had moved one in 2009, and then again in 2016 with the P3 (US, UK and France), before the P3 nations' last proposal in 2017. According to the spokesperson of the Defence Ministry Lt Colonel Devender Anand, the firing in Krishna Ghati stopped by 7 am. The US, the UK and France have moved a fresh proposal asking the UN Security Council to designate Jaish-e-Mohammed chief Masood Azhar as a global terrorist, PTI reported. This listing will subject him to global travel ban, asset freeze and arms embargo. After fresh ceasefire violation Thursday, Indian Army is retaliating to Pakistan firing in Krishna Ghati area of Poonch. Union Finance Minister Arun Jaitley hit out at the Opposition for saying that the government was 'politicising the sacrifices made by the armed forces' and said it is important for India "to speak in one voice". Taking to Twitter, Jaitley said, "The Cross Border terror attack in Pulwama was a reality. The Balakot Operation was India’s Anti- Terror preemptive strike to defend its Sovereignty. The whole nation has spoken in one voice. Why then is India’s opposition alleging that the Government is politicising our Anti-Terror Operations. My appeal to India’s opposition - “Let the country speak in one voice”. Please introspect - “Your ill-advised statement is being used by Pakistan to bolster its case." Former prime minister Manmohan Singh was quoted as saying by PTI, "I hope saner counsels will prevail between the leadership of India and Pakistan." Handing over a dossier to the Acting High Commissioner of Pakistan on "specific details" of the involvement of Jaish-e-Mohammad in the Pulwama terror attack, the MEA said, "A dossier was handed over to Pakistan side with specific details of JeM complicity in Pulwama terror attack and the presence of JeM terror camps and its leadership in Pakistan. It was conveyed that India expects Pakistan to take immediate and verifiable action against terrorism emanating from territories under its control." The alleged capture on Wing Commander Abhinandan, if true, is a grim reminder of the Kargil war when flight lieutenant K Nachiketa was taken prisoner by the Pakistan Army on May 27, 1999 following ejection from his MiG-27 aircraft after suffering engine flame-out. He was subsequently sent back to India eight days later after being interrogated by the authorities. Upon his capture by Pakistani Northern Infantry, Nachiketa was subjected to intense thrashing before a senior officer intervened and ordered his men to back off. Following intense backdoor efforts by the Indian government, Nachiketa was handed over to the Red Cross that brought him back to India where he was greeted by President K R Narayanan and Prime Minister Vajpayee as a hero. Read full story here. Condemning the capture of Wing Commander Abhinandan, MEA said, "India also strongly objected to Pakistan’s vulgar display of injured personnel of the Indian Air Force in violation of all norms of International Humanitarian Law and the Geneva Convention. It was made clear that Pakistan would be well advised to ensure that no harm comes to the Indian defence personnel in its custody. India also expects his immediate and safe return." Lodging a protest with the Acting High Commissioner of Pakistan in the national capital over the "unprovoked act of aggression by Pakistan against India", the Ministry of External Affairs condemned the "violation of the Indian air space by Pakistan Air Force and targeting of Indian military posts". In a statement released later, the government said, "It is unfortunate that instead of fulfilling its international obligation and bilateral commitment to take credible action against terrorist entities and individuals operating from its soil, Pakistan has acted with aggression against India." Taking to Twitter, Pakistan Armed Forces spokesperson Major General Asif Ghafoor said only one Indian pilot is under Pakistan Army's custody. Expressing "deep anguish over the blatant politicisation of sacrifices of armed forces by ruling party", the Opposition in its statement said, "National security must transcend narrow political considerations. The leaders observed that the Prime Minister has, regrettably, not convened an all-party meeting as per the established practice in our democracy." Addressing the media, Congress chief Rahul Gandhi said, "The meeting of leaders of 21 political parties condemned the dastardly Pulwama attack by Pakistan-sponsored terrorists of Jaish-e-Mohammed on 14th February 2019 and lauded the action taken by our armed forces." In the wake of the ongoing tension, India has summoned Pakistan's Deputy High Commissioner to protest against the attack by Pakistan Air Force on Indian military installations earlier in the day, the Ministry of External Affairs said. Railway sources told The Indian Express that no instructions have been issued to stop Samjhauta Express from New Delhi due for departure tonight. "Twenty-six passengers have booked their tickets- four in AC, 22 in non-AC," sources said. Officials cited the 'prevailing situation' as the reason behind the drop in the number of passengers. Noting that all wars are miscalculated, and no one knows where they lead to, Khan said that better sense must prevail and the two sides should act with wisdom. "I ask India: with the weapons you have and the weapons we have, can we really afford a miscalculation? If this (situation) escalates, it will no longer be in my control or in (Prime Minister) Narendra Modi's," Khan said. "Let's sit together and settle this with talks," he added. In a live TV address, Pakistan Prime Minister Imran Khan claimed that two Indian MiGs had crossed the LoC and were shot down. "It was our plan to not cause any collateral damage, and not to cause any casualties. We simply wanted to show capability. Two Indian MiGs crossed Pakistan’s Borders, and we shot them down. I want to now address India and say let sanity prevail." Expressing concerns over the tension between the two nations, Nepal Ministry of Foreign Affairs, in a statement said, "The Government of Nepal is concerned about the escalating tensions between India and Pakistan following the terrorist attack on security convoy in Pulwama in Jammu and Kashmir on February 14, 2019. As current Chair of SAARC, Nepal calls on both sides to exercise utmost restraint and not engage in actions that would threaten peace and security in the region; also urges them to seek a solution through dialogue and peaceful means in order to ease tension." India-Pak tension LIVE Updates: In this photo released by the PMO, Prime Minister Narendra Modi chairs a meeting of the Cabinet Committee on Security in New Delhi Tuesday, following the Indian Air Force’s strike on a terror camp in Balakot. Early on Wednesday, Pakistan Foreign Affairs Spokesperson Dr Mohammad Faisal Wednesday tweeted: "#PAF undertook strikes across LoC from Pakistani airspace. Sole purpose of this action was to demonstrate our right, will and capability for self defence. We do not wish to escalate but are fully prepared if forced into that paradigm #PakistanZindabad." The Pakistani government also said it had an IAF pilot in its custody. A statement released by the Indian Ministry of External Affairs (MEA) stated, "India strongly objected to Pakistan’s vulgar display of an injured personnel of the Indian Air Force in violation of all norms of International Humanitarian Law and the Geneva Convention. India expects his immediate and safe return." Protesting against the "unprovoked act of aggression by Pakistan against India", the government said, "It is unfortunate that instead of fulfilling its international obligation and bilateral commitment to take credible action against terrorist entities and individuals operating from its soil, Pakistan has acted with aggression against India." Meanwhile, Pakistani troops have been targeting civilian hamlets and forward posts along the LoC since Tuesday evening. Defence Ministry Spokesperson Lt Colonel Devender Anand said retaliatory action has resulted in "severe destruction of five Pakistani posts and a number of casualties to Pak Army". Ties between the two countries have escalated since the Jaish-e-Mohammed carried out an attack on a CRPF vehicle in Pulwama on February 14, which killed 40 personnel. India had subsequently struck a camp of the Pakistan-based terrorist group in Balakot on February 26.